Fate stay night, more like fate inconsistent height! Amirite?! Fate/Zero Box Sets I & II are currently out of stock, more is expected however chances are it could potentially just go straight to out of print. 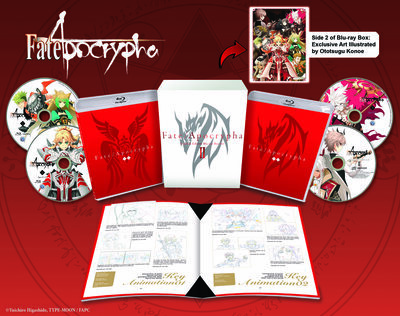 A complete series BD-BOX is available in Japan with English dub & subtitles if you want to own the Aniplex version of the series. Monogatari's Koimonogatari is currently out of print, no word on whether it will be reprinted or remain unavailable. Is it just a matter of time before AL license Pancreas do we think? Monogatari's Hanamonogatari & Onimonogatari are currently out of print, no word on whether it will be reprinted or remain unavailable. And so I have to drop my selling price of Plastic Memories. Hopefully AL do a box for both parts of GGO. Heads up, Fate/Stay Night [Unlimited Blade Works] Box 1 is now out of print. Box 2 is still around but probably for the next couple of months or so. It's currently not known whether Box 1 will be reprinted like Fate/Zero though. We know something about reprint/complete versions of Occultic;Nine or Plastic Memories? It will be a long while before we'll hear any news on a re-release. The chances of a reprint are very low unless it was a recent release. If I had to guess the next Complete BD-Box title will likely be Fate/Zero, Kill la Kill, Monogatari series: Second Season, and Nisekoi Season 1. Well, they just mean the sets are OOP as in no more copies will be coming from AoA - but RS could have just received an entire skid-full of any given title in their warehouse as a final shipment from AoA, so it could be a while yet until many of those titles are completely gone. But, it did get me to order one more AoA title I was needing to get, sooner than I had planned, so it's a good marketing strategy. I've updated the first post to highlight all of the OOP warnings from Rightstuf as well as the recent new listings of Record of Grancrest War and Sword Art Online Alternative: Gun Gale Online.